FlowJo’s interface is based on a Ribbon, similar to that found in Microsoft Office products. This page explains the nomenclature and properties of FlowJo’s implementation of Ribbons. A window’s ribbon is made of thematic tabs, which break into bands, which contain tasks. Ribbons become useful when organizing features in the Workspace, Table, and Layout Editors, which have previously been folded into menus and sub-menus. These are akin to nested containers that hold features of the program. Bands hold features or tasks, Tabs hold groups of bands, and Ribbons hold both tabs and bands. Ribbons and bands follow the Microsoft Fluent User Interface model, which places a greater emphasis on visual orientation to software features along with customization of the interface to speed the use of frequently accessed features or actions in a program. Ribbons contain both tabs and bands, along with access buttons for preferences, ribbon configuration, language switching, and accessing other areas of the program. The various ribbons in the FlowJo workspace are explained in greater detail here. Tabs are bundles of bands, organized by similar function. 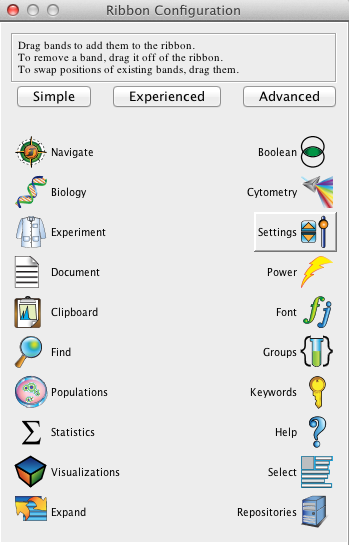 For example, the Workspace tab (below) contains the Cytometry, Groups, Populations, Statistics, and Keywords bands. These bands are all related because they are the commonly used groups of tasks in the Workspace when working with samples, subpopulations, and their respective analysis information. Bands are bundles of similar features or program tasks. Think of bands as menus, but with more granular organization, images, and tool tips. 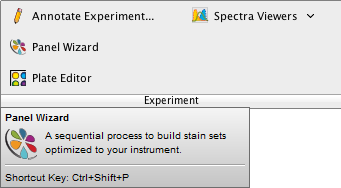 The Experiment Band below is shown with the tool tip generated by hovering over an action — in this case “Panel Wizard” (outlined in blue). There are multiple bands per tab, and bands can be added or removed from tabs via drag-and-drop. The bands for each tab can be customized. Clicking on the Ribbon menu, you can drag and drop your preferred functions/features (bands) anywhere inside a tab.